Rise of the Tomb Raider: The Official Art Book is a wonderful companion to the game. Just like the previous artbook, it's filled with plenty of beautiful concept art of characters, environments and props, complete with commentary that talks about the design process. There are major spoilers in the book so do not go through the book before finishing the game. The artworks are very detailed and printed huge. They mostly digitally painted, like any other game artbooks, but is able to retain the painterly look for many of the scenes paintings. There aren't much game screenshots. As the art director Brenoch Adams said, he wants to put the 'Tomb' back in Tomb Raider. If that's so, it's a job well done in terms of the look and feel. I like Lara Croft's updated look and the several outfit changes throughout the game. Other character designs are alright, but nothing too out of the world, after all it's still based on the so called real world. The more interesting designs are the Deathless Ones. I can't help but compare it to the Uncharted series. The content definitely feels like there are some similarities to Uncharted 2: Among Thieves, one of my favourite games all time. There are the ice mountains and mysterious caverns. However, the art direction for Tomb Raider is visually darker. The colours are muted and there's use of a lot of darks and shadows. The good thing is not all details are lost into the shadows. Overall, it's just a different feel to Uncharted although you know that both are adventure exploratory games in the same genre. 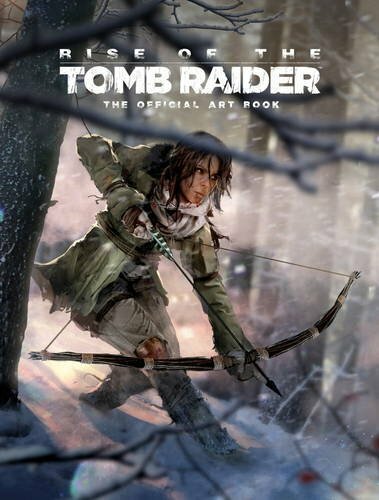 The first artbook for the reboot Tomb Raider series, Tomb Raider: The Art of Survival, brings a welcome update to the art direction. That is a great book and at the time I'm writing this, that book is already out of print and selling at higher than normal prices. So yes, the game is popular and the artbook as well. If you want to get this book, get it early. Recommended to fans of the game, artbook and concept art lovers. By the way, if you like this book, be sure to check out The Art of Uncharted 2: Among Thieves.